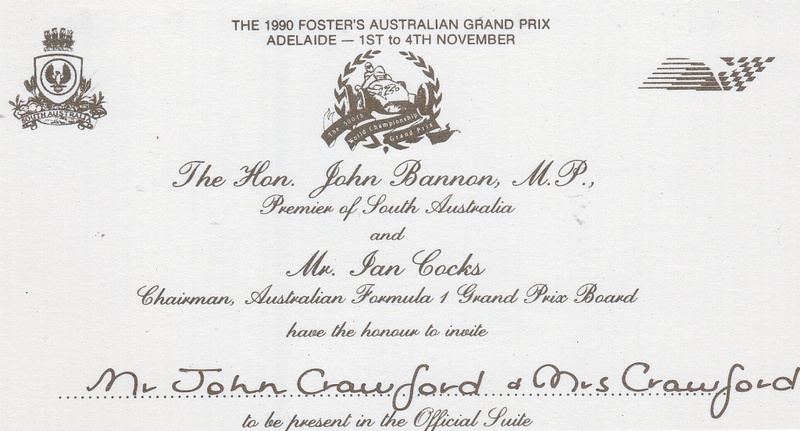 Since writing about my very enjoyable meeting with Ron Tauranac, I once again delved into my photo archives to recall the 1990 Australian Formula One Grand Prix in Adelaide. It was the last AGP I attended, before leaving Australia to take up my new job as PR VP for Jaguar Cars North America. 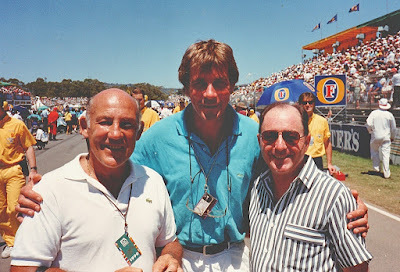 As I had been, since the very first modern F1 AGP in Adelaide in 1985, I was accompanied by Stirling Moss. 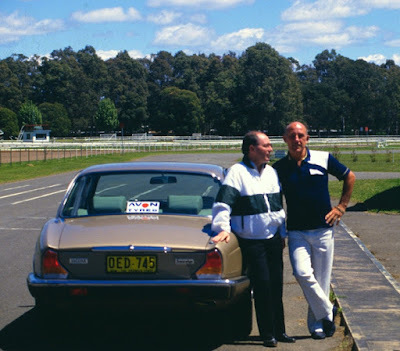 My then employer (Jaguar Rover Australia) had brought Stirling to Australia, so we could schedule a series of exclusive drive days in each state for our Jaguar customers. I always ensured that our drive days coincided with the AGP, so that we could get full media value from our association with Stirling Moss. Stirling’s Jaguar credentials go right back to 1950 and his first race in a Jaguar – an XK120 privately owned by sporting gentleman Tommy Wisdom. 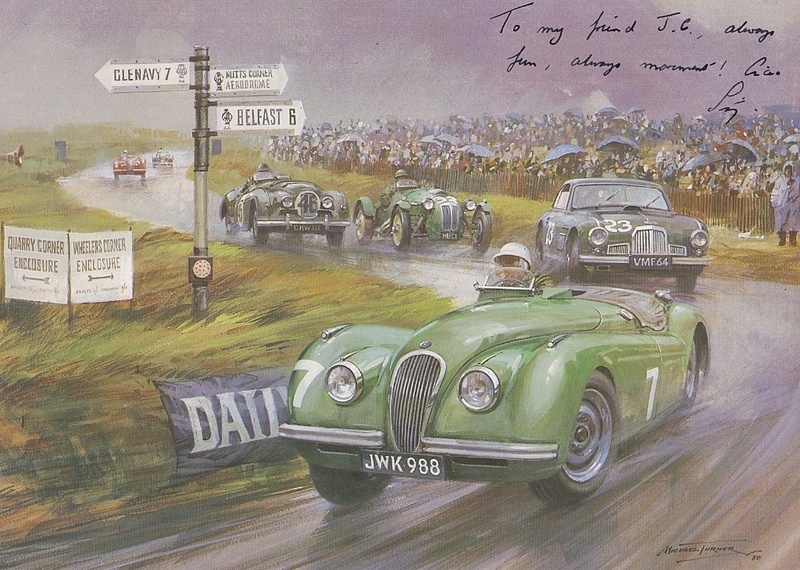 Stirling won the race in appalling weather conditions, under the watchful eye of Jaguar founder, Sir William Lyons. Lyons had flown to Belfast in a chartered plane. He was so impressed with Moss’s driving, Lyons later added him to his team of factory drivers. 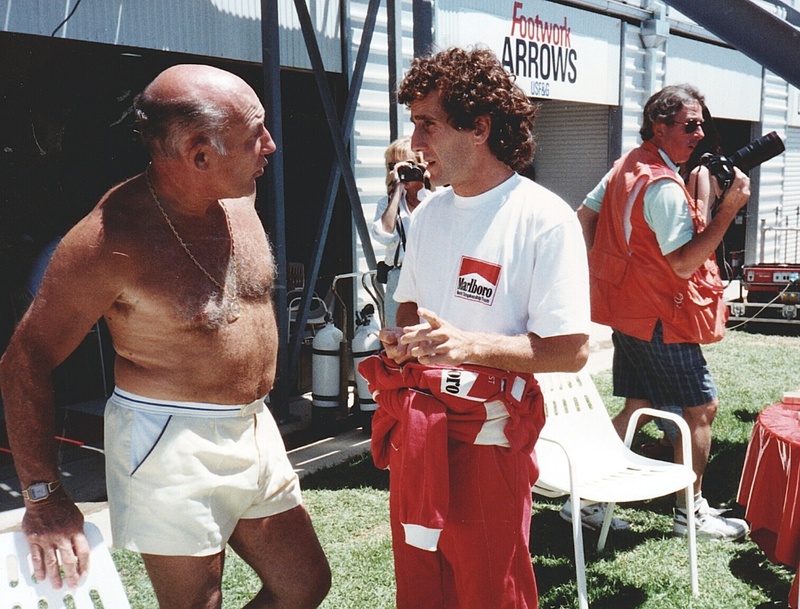 However, enough fifties flashbacks - now to1990 and Stirling was joined in the VIP suite by Juan Manuel Fangio, making his second appearance at the AGP. 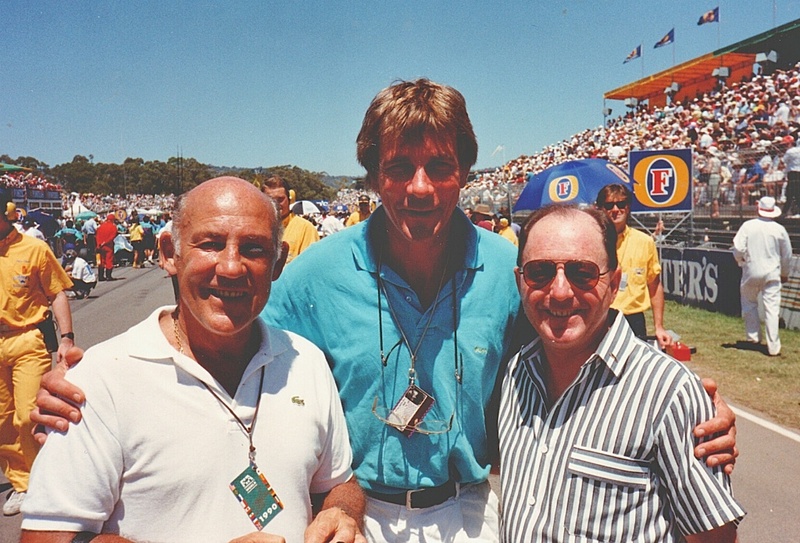 Both he and Stirling were VIP guests at the Adelaide AGP in 1986 (right). On that occasion Stirling and Fangio participated in the famous 'Climb to The Eagle' - with Moss in a C-type Jaguar and Fangio in this Silver Arrows, which Mercedes-Benz had flown to Adelaide just for this event. I was also very honoured to join the VIP guests, following a personal invitation from the then Premier of South Australia, the late John Bannon. I had become good friends with him due to the fact that Jaguar Australia always staged a media cocktail party on Saturday night before the race, and ensured we had our own selection of VIPs attending, to help maintain continued media interest in the AGP. The photos reproduced here were taken on Saturday, during practice for the Grand Prix, but viewing them now helps to endorse what a fortunate fellow I am – being able to move in the circles of motor racing royalty with stars like Fangio, Moss, Prost, Senna et al. 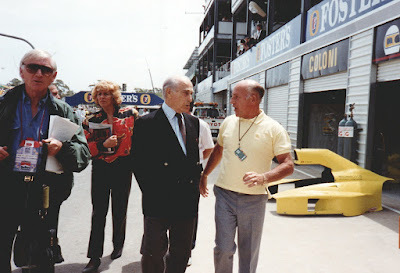 I was able to accompany Moss and Fangio as they strolled through the paddock and pits, taking some memorable photos of the two aces together. 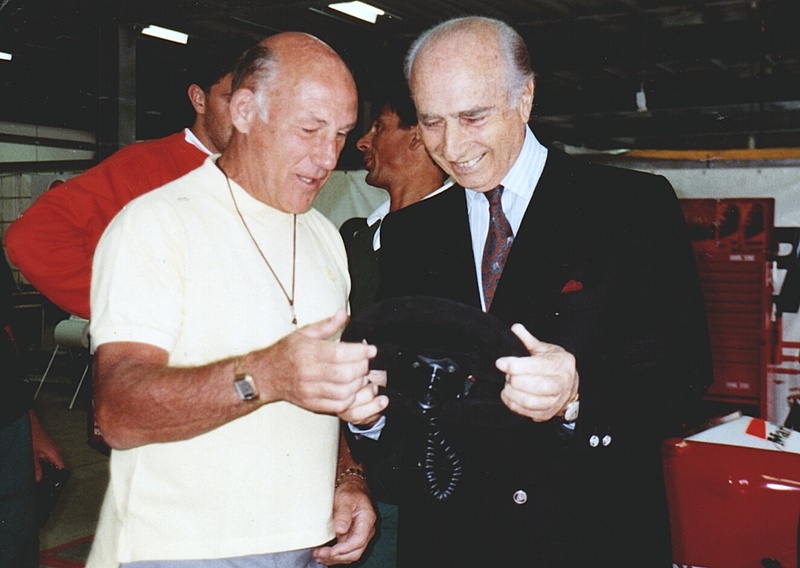 They always conversed in Italian, because Fangio’s conversational English wasn’t up to speed, but Stirling spoke quite good Italian, especially after his many appearances in the Mille Miglia. Later, just after this photo of Stirling and Alain Prost was taken, Prost kindly invited me to join him and Stirling in his motorhome as they discussed the various corners, Prost’s car, and race tactics. What an honour, to join the discussion. 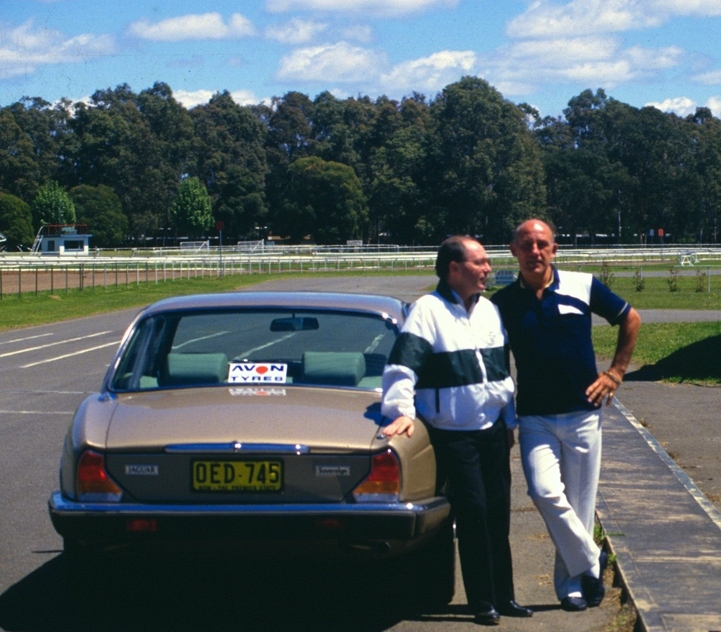 Thanks to our mutual friend Bernie Ecclestone, Stirling had been able to complete about a dozen laps in a Jaguar XJ-S we had brought for his use, so he knew exactly what Prost was referring to when they discussed the circuit. Stirling and the late James Hunt always got on famously, because underneath the age difference, there lurked two similar, irascible, personalities. Although I have to say Stirling’s hijinks were no match for James’ exploits when he was off-duty. 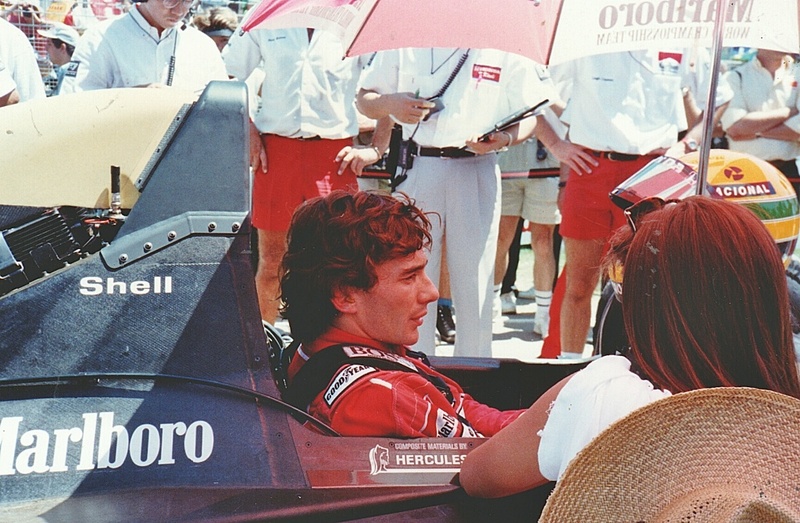 Just before final qualifying got under way, I was on the grid with Stirling, and was able to take this great shot of pole-sitter, the late Ayrton Senna. 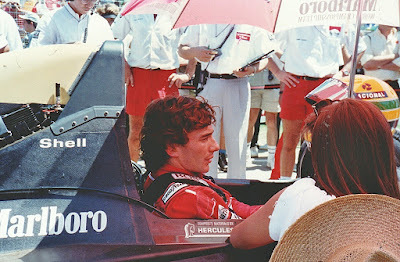 Senna unfortunately was a DNF in the race, won by Nigel Mansell. I think perhaps one of the most memorable F1 photos I have ever taken was the traditional ‘lineup photo’ on the grid, of the 1990 competitors, with Fangio in the centre. 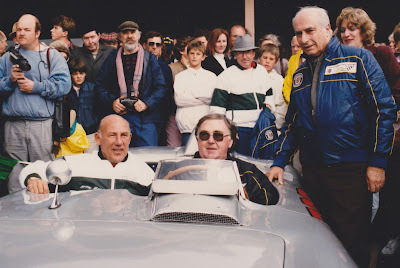 Way out on the right hand side of the photo, are my two mates, Stirling Moss and Jack Brabham, looking like a couple of bridesmaids – as the great Argentinian champion took centre stage. Although Mercedes-Benz always provided a car and driver for Fangio (wherever he went in the world), Fangio rode with Stirling in the XJ-S between some social events. 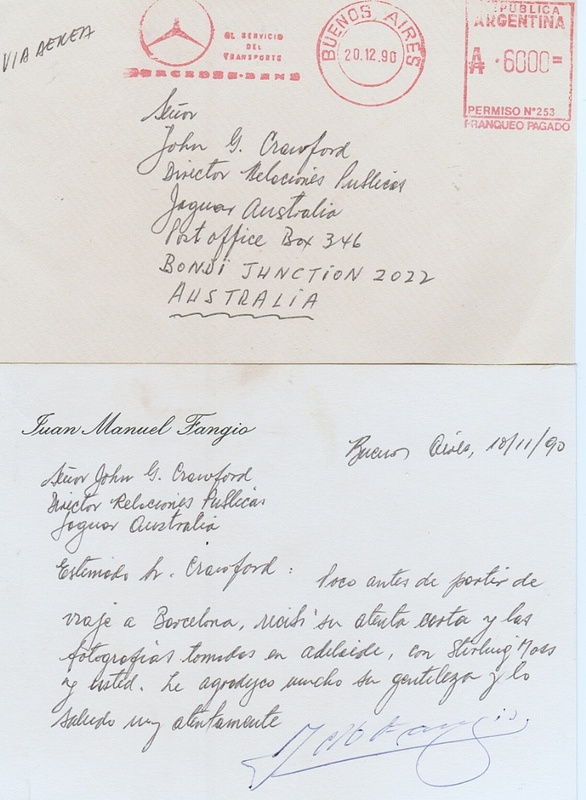 On one occasion I had the honour of driving the great man to the track one morning, resulting in a hand-signed ‘Thank You’ note from Fangio, after he returned to his home in Buenos Aires. What a fortunate life I have enjoyed among great cars and great racers.